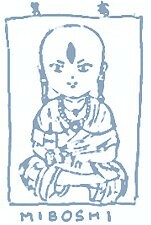 Character: Miboshi is an evil monk. According to the manga, it seems that he is not human, he does not have a body. He indeed has great power since he can takes over and controls other's bodies.